Over the next few weeks and months, you will probably notice that the blog will gradually undergo a few changes in terms of look and content. And one of the things you will definitely see more of, is a separate category that will focus on Travels (RB Travels) -- and by that we mean, travels that are still related to weddings such as honeymoon destinations, engagement and wedding travel photo shoot locations, just to name a few. As some of you who frequent the blog already know, travel has always been an integral part of the blog--we've done editorial shoots in several countries and have recommended honeymoon ideas here and there. Traveling is something that personally comes to me naturally, as I have been traveling for over 25 years. Our family has a traveling business, I'm on TripAdvisor's top 1% Reviewer List, and I have a separate travel account on Instagram (@eatwedtravelpdx). My husband and I also travel annually -- we'd like to think that honeymooning should be a yearly tradition. As for you guys who may still be in the wedding planning stage, you will soon realize that although the wedding is exciting, midway into your wedding preparations and you'd probably just want to get married and be done with it. This often happens when the preps is so long (like one year), or when problems and conflict arise well into the preps. So the honeymoon is something to really look forward to. In fact, some couples prefer to spend more on their honeymoon fund, rather than the wedding fund. If you also plan to get pregnant right away, note that you will not be able to go on an "all-out travel adventure" for a very long time so maybe prioritizing your honeymoon is just as much of a once-in-a-lifetime experience as the wedding. Just like there's a wedding theme for every couple's personality, there's also a a honeymoon destination for every couple's travel preference and style. Some may want to explore the usual spots like Paris, New York, etc. Some may want to be on the adventurous side and maybe go to Africa or Iceland. But there's also the couples who want complete and utter privacy and relaxation. And that's what the Maldives has always been known for. 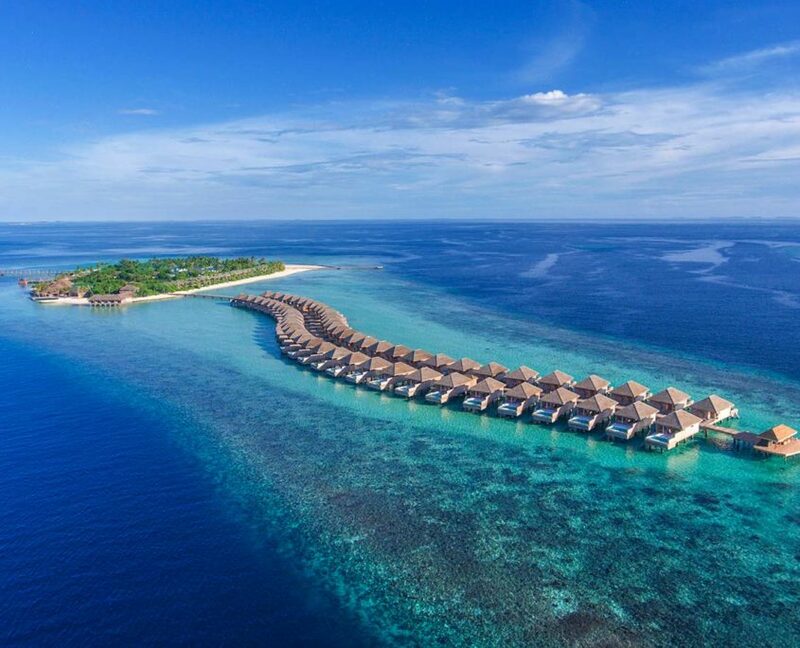 Although the Maldives has gone mainstream in the past, then sort of plateaued and relegated into a cliche in recent years, new developments have made the island country into a hot spot once again. In our case, the Maldives has always been on our bucket list (we even have a piggy bank decor at home labeled as "Maldives Fund"), but we had purposely delayed our very first trip to the Maldives out of fear that we might be disappointed. It is a high-end travel destination so in our case, we felt that it had to be perfect--absolutely no room for error. And so finally, the perfect island resort was developed late last year. Hurawalhi is a 8-month old resort (as of this writing), and the vibe of the resort just really spoke to us on a personal level. Add the part where it's an "adults-only" resort, and we were sold. We first saw this video on Hurawalhi and we got so excited. The video actually looks like a Same-day-Edit doesn't it? After seeing this video, we booked this dreamy island resort via Booking.Com straight away and packed our bags in July of 2017. Enough babbling. Here's Hurawalhi through our pastel-colored eyes. We stayed at Hurawalhi for a total of five days, and got the ocean pool stilt villa. Seriously, selecting the photos to use for this blog post is one of the hardest things I've had to curate in the blog because we literally have hundreds of amazing photos to prove to you just how amazing Hurawalhi, Maldives is. 1. Hurawalhi, Maldives is located in the north of the pristine Lhaviyani Atoll. It is far from Male (Maldive's main city) making it a remote private island that is on the non-mainstream side. 2. The interiors of the resort is clean, chic, and has an understated luxurious elegance about it. Some resorts at the Maldives can be too traditional and outdated, while others are on the over-the-top side. Hurawalhi has the perfect balance of modern and natural. I call it, "Tropical Scandinavian" -- if that makes sense. 3. The island resort has so many thoughtful details -- from the custom-created coasters which has a different design depending on which restaurant/bar you are at, from the after sun care found on the beautiful bathroom, to even the little surprise view you get on Duniye Spa's massage table. Everything was carefully thought of, to make for a delightful experience. 4. Hurawalhi is home to the world's largest undersea restaurant called 5.8 (aptly named since the restaurant is submerged 5.8 meters below the sea). The restaurant is definitely a site to behold, accompanied by a most unique fine dining, 7-course meal. 5. Hurawalhi is also home to the award-winning spa, Duniye Spa with treatments that are surprisingly affordable and just absolutely relaxing. The view here is also something else. 6. The food, particularly the buffet spread, is one of the very best buffets we've ever had in the world. What makes it delicious and extraordinary is the fact that it has such an extensive offering without being too overwhelming. Definitely quality over quantity. And each and every dish, sauce, fruit, and even milk are crafted with utmost focus on all things fresh, local, and being environment-friendly. The other restaurants are likewise impressive and there's additional romantic options to set-up a candlelight, sunset dinner by the beach or in your own villa via room service. 7. Hurawalhi is one of the most eco-friendly and sustainable hotels in the Maldives, making it one of the most innovative. Some of their notable practises include a zero-plastic policy (everything is in bottles--even the yogurt), they are also 60% solar powered, and they have a collaboration with conservation groups and marine biologists to ensure best practises for island activities. So if this is something that you care about, this resort is definitely for you. 8. The Champagne Pavilion has the most amazing view of the pastel-colored Maldivian sunset, plus it is an exciting look-out point to view sharks, dolphins, and even manta rays if you get lucky. 9. 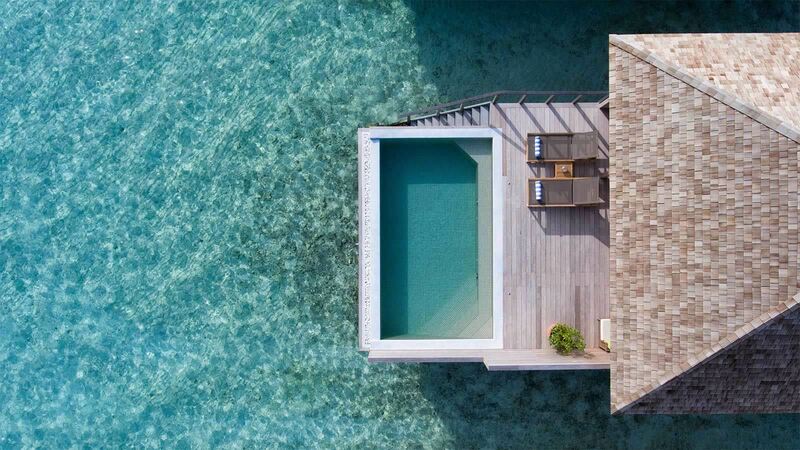 The Ocean Pool Villa is absolutely heaven sent. You wouldn't want to leave your villa for sure. We loved waking up in the morning to see the gorgeous turquoise-colored Maldivian ocean from our bed. And we loved lounging in our private deck during lazy afternoons. Pictures don't even give justice to just how idyllic, romantic, and relaxing this place is. It's just absolutely epic and probably one of the most compelling reasons I have, to want to come back in the future. 10. Hurawalhi is simply a wondrous place to take-in the beauty of the Maldives. I never thought I would get impressed with the Maldives' beaches as I am already very partially biased to the powdery, white sand beaches of the Philippines. But the Maldives is something else. It's paradise in every sense of the word without any stresses of traveling, pollution, and even crime, to worry about. How to get there: there are numerous flights that go to Male, Maldives with layovers in Singapore and Kuala Lumpur. We decided to try Air Asia's Premium Economy flight to Male and paid only $1,000 round trip for 2 pax. This is actually quite a low price considering how expensive flights to Maldives can get. Other airlines that have flights to Male include Singapore Airlines, Etihad, Cathay, Sri Lankan Airlines, Emirates, Turkish Airlines, and would you believe--Cebu Pacific. From Male, you will have to fly again to Hurawalhi, this time via a seaplane using Trans Maldivian Airways. This is about $700 round trip for 2 pax. 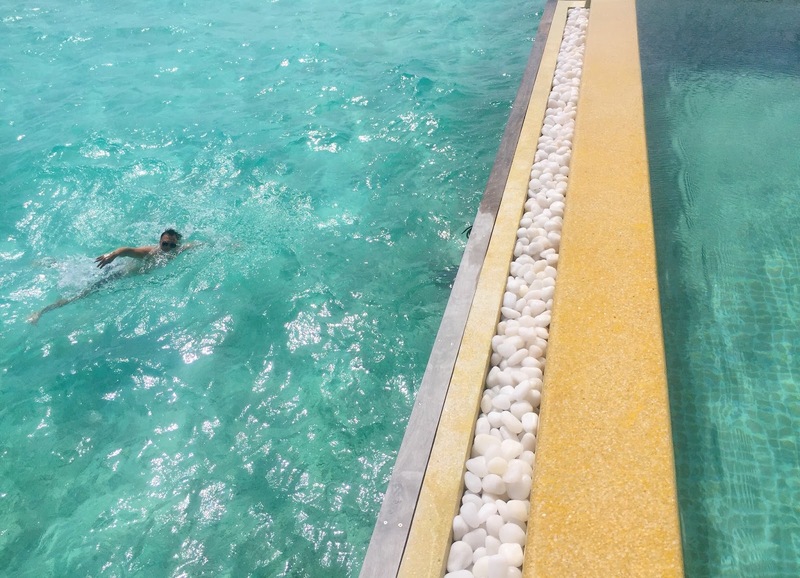 For our Ocean Pool Villa, we got it at an off-peak rate of $600+ per night but it can go as high as $1,300+ during peak season (off-peak season in the Maldives is from July-August but weather-wise, the country enjoys a year-long tropical, summery climate). Total expense for our 1-week trip including airfares, accommodations, food, shopping, and other activities is roughly about $5,000-$6,000 (we stayed in Hurawalhi for 5 days but also stayed near Male for 1 night and had lots of layovers in KL). Amanpulo is even more expensive. We already checked. Overall I would say this trip was absolutely worth it, not just because Hurawalhi (and the Maldives in general) was like "Heaven on Earth," but also because the bonding experience my husband and I had together was priceless. At the end of the day, it's about connecting and re-connecting with your spouse without the distractions of the daily, monotonous grind.